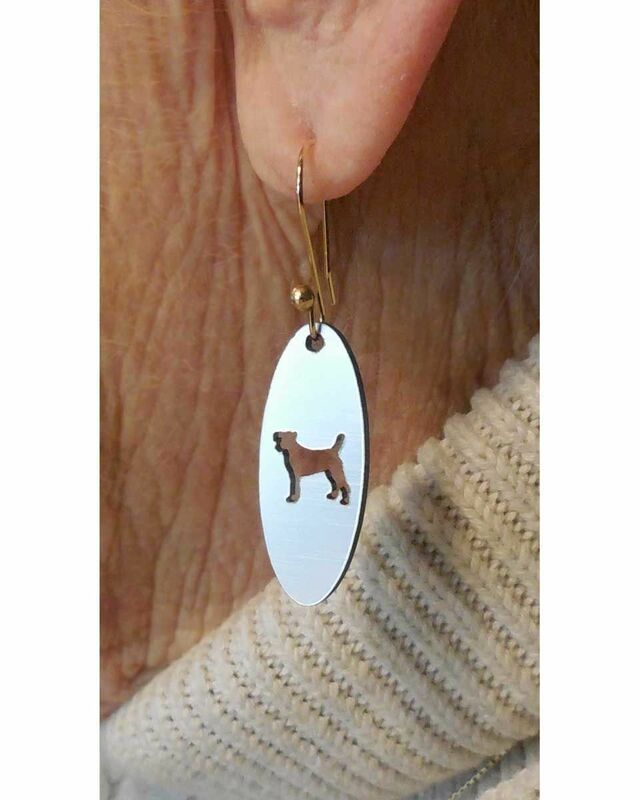 Dog Breed Silhouette Earring for Dog Lovers - - Dog lovers pay attention. Comfort House exclusive. 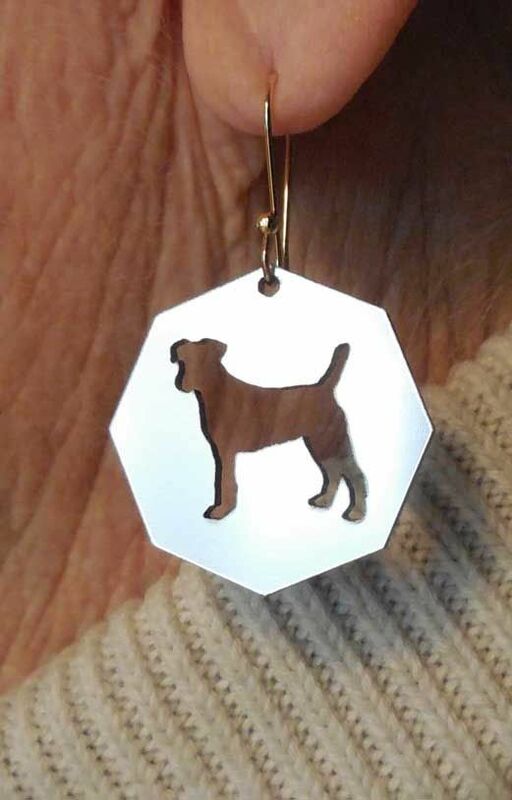 These stylish, fun earrings are unusual in that a silhouette of your favorite dog breed is cut out in the center. Choose from German Shepherd, Lakeland Terrier, Airedale, Chow Chow, Pointer, Irish Setter, Bulldog, Retriever, Corgi, Beagle, Poodle, Labrador, and other breeds shown in our image. Fast turnaround; ships in 2-3 days. Lightweight acrylic oval or hexagon shaped earring with fish hook hangers. Hangers are gold plated stainless steel. The oval shape is sleek and trim at approximately 0.5" wide x 1.250" long. The octagonal shape is 1.125" across the flats. Your choice of 26 different dog breeds. Please make you selection using the small image on far right. Twelve vivid color combinations: evergreen with white reverse; black with white reverse; yellow with black reverse; red with white reverse; brown with white reverse; sky blue with white reverse; brushed gold with black reverse; brushed stainless with black reverse; beige with brown reverse; wood tone with white reverse; white with black reverse; and pink with white reverse. NOTE: Earrings are reversible because the front and back sides are different colors. 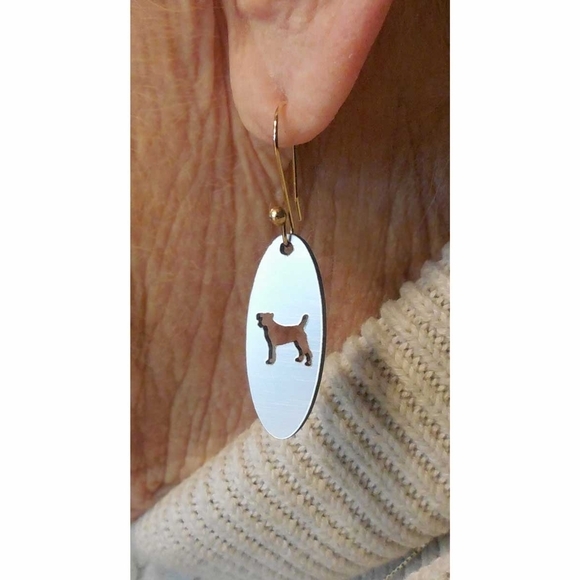 This Dog Breed Silhouette Earring is the novelty earring for any Dog Lover with pierced ears. Made in USA exclusively for Comfort House.